ROGER W. VANCAMP, 92, of Fort Wayne, passed away April 6, 2018 at Heritage Park. He was born October 10, 1925 in Wells County to the late Donald W. VanCamp and Bonnie L. (Dickason) Niblick. He was a Navy Veteran, serving in the European and Pacific Theaters during WWII. He retired in 1985 as a brakeman from Norfolk Southern Railroad after 40 years. After retirement he owned and operated B & C Allis Chalmers Parts from 1991 to 2017. 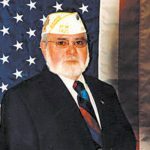 He is survived by his children, Marsha Kay (Steven) Ratliff and Ronald Alan VanCamp; daughter in law, Mary Lou VanCamp; brothers, James “Weed” VanCamp and Frank VanCamp; grandchildren, Jessica Sullivan, Jacob Heilman, Jeff VanCamp, and Amy Howell; four step grandchildren; and 14 great grandchildren. He was also preceded in death by his wife, Wilma Patricia (Thomas) VanCamp in 1991; son Donald W. VanCamp in 2008; two sisters; and a brother. Funeral service will be Wednesday, April 11, 2018 at 6:00 PM at Elzey-Patterson-Rodak Home For Funerals, 6810 Old Trail Road, Fort Wayne, IN 46809 with visitation from 2:00 to 6:00 PM. Preferred memorials may be made to St. Jude Children’s Hospital. Visit www.elzey-patterson-rodakfuneralhome.com to leave condolences.